В Америке новый тренд. Риэлторы говорят о том, что многие предствители молодежи поколения Y (20-30 летние) стали интересоваться и приобретать более дорогую первую недвижимость сразу от миллиона долларов. Обычно первая покупка была на несколько сотен долларов, но новая волна просто пропускает этот этап и идет сразу к элитной собственности. Большая часть занимается собственным бизнесом или заработали деньги в хайтек индустрии. Это связано с тем, что они выросли в момент коррекции рынка акций и доверяют больше инвестициям в недвижимость. В ответ на этот тренд многие агентства начали рекламировать эксклюзивные дома и кондо в социальных сетях и Инстаграм. "I have always felt that having your money in property is the safest and best thing to do if you want to grow your personal wealth," says Mr. Winter, who founded his design company at 23. None of Mr. Winter's assets are in the stock market—he says the market "spooks him" and that he prefers to invest in real estate. In recent years, low interest rates coupled with lower real-estate prices had also made it easier for people in their 20s and early 30s—whom demographers refer to as "Generation Y" or "millennials"—to buy. "In the last two months, half the folks I sold homes to were young entrepreneurial types—and they were all buying homes for over a million dollars," says Michael Rankin, a managing partner at TTR Sotheby's International Realty in Washington, D.C. "A few years ago, that kind of buyer was invisible. We had young folks buying starter condos for a few hundred thousand dollars. But this new wave is skipping that step entirely and going right for the high-end home." Matt Winter, in the kitchen with his wife, Tara, recently bought this Spanish-revival home in Los Angeles's Westwood. In March, Mr. Rankin helped broker a deal for Grant Allen, a 34-year-old who works in venture capital and paid $1.1 million for a 2,400-square-foot three-bedroom row house in D.C.'s Logan Circle neighborhood. His 28-year-old fiancée also owns a condo in the city, but in part because of Mr. Rankin's advice the couple decided to keep it as an investment and now rent it out for $3,250 a month. "The stock market has popped lately, but I view it generally with a lot of skepticism," says Mr. Allen, who adds that he has recently reduced his exposure to public equities to about two-thirds of his assets from three-quarters. "These days, I feel like you need to put your money in something that's more of a sure thing." 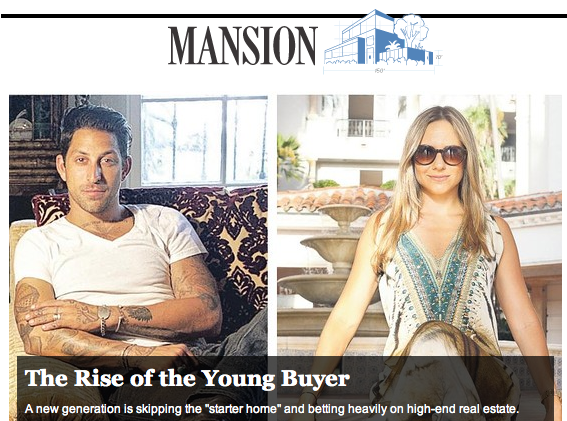 "My generation—we got burned pretty bad by the stock market, we're tired of paying rent, and we don't see any better place to put our money," explains Oren Alexander, a 26-year-old real-estate broker who caters to many young, wealthy buyers. He had about 25% of his assets in the stock market but liquidated them in 2012 to invest in real estate instead. He is in contract to buy his first apartment for $1.5 million, a 1,000-square-foot two-bedroom on the Bowery in downtown Manhattan. Some investment professionals caution against the strategy. Andrew O'Daniel, a senior vice president and financial advisor at Morgan Stanley, MS -0.36% says home buyers of any age shouldn't look at their primary residence as an investment but rather as a useful necessity, because equities and other assets tend to offer better returns. "If they can make a little money off their home, because of where we are in the real-estate cycle, so be it. That's a nice fringe benefit," he says. "But it shouldn't be the number one objective." Another factor in the surge: the tech boom. Brokers say many of the young buyers today have made money during the IPOs of technology companies such as Facebook, FB -1.14% Google,GOOG -1.55% LinkedIn, or they have profited by starting their own companies. Ken DeLeon, a broker in the San Francisco Bay area, says that he has seen a large shift in recent years among high-end home buyers, with 70% more people under 35 in the mix today than just two years ago. Part of that comes as young tech titans, rich in stock, attempt to diversify their portfolios. "We felt that real estate was a much more stable asset class than equities. It also offers tax advantages, which a lot of our friends in tech are looking for these days," says former Facebook executive Rick Armbrust. Now 33, Mr. Armbrust and his wife, Sheila, a litigator, paid $1.2 million for a newly built 2,000-square-foot duplex condominium in Noe Valley about 2½ years ago. These young techies are often making big real-estate leaps too, jumping from a modest monthly rental to a large home in a single step, rather than purchasing the starter home that was a home-buying hallmark of other generations. "One of my Facebook clients recently moved from an 800-square-foot rental apartment to a 9,000-square-foot home, which they purchased for $7 million," Mr. DeLeon recalls. Many young buyers are also selecting the most expensive markets in the country, brokers say, skipping modest neighborhoods in favor of the exclusive. Fernanda Vidigal, 33, recently paid $2.2 million for a 2,530-square-foot condominium on Fisher Island, a members-only community in Miami. Ms. Vidigal, who works in finance and lives most of the year in São Paulo plans to spend an additional $1 million to renovate the unit, which has floor-to-ceiling windows that overlook the ocean. "The apartment was cheap for what it is," says Ms. Vidigal. "We got a good value—and moreover, it will be really easy to rent this place once it is renovated." This lavish spending at the high end is in part due to a consolidation of wealth among the global elite, says Jeff Hyland, a top luxury broker in Los Angeles whose firm Hilton & Hyland brokered a deal for the Ecclestone family. "There is so much more wealth today among the superrich," says Mr. Hyland. "More than ever these families need a way to safely and quickly distribute money to their children and to different countries. Real estate is a great answer." "I've seen more parents buy homes for their children in the last year than in my whole career," says Jade Mills, a luxury broker in Los Angeles. "It was very unusual 10 years ago. In the last year, I've sold six houses to clients whose parents paid for them." Olivia Waldman, a physician assistant in surgery, approached her parents a few years ago about her desire to buy an apartment in Manhattan. To her surprise, they suggested they contribute to the purchase so they could buy a larger place that might be a better investment. They ended up buying a two-bedroom condo on the Upper East Side for $1.15 million in cash. Ms. Waldman, now 33, didn't contribute to the purchase but pays the monthly maintenance fee. "The apartment is much bigger than I personally would have wanted for myself, but it makes a lot of financial sense because it will resell better than a small studio would," she says. "For the first time since the pre-Depression, Gatsby era, we have a generation of kids whose parents made a great deal of money and are giving a great deal of it to their children," says Jim Taylor, vice chairman of the Harrison Group and an author of the study. "Prior to this, very few families had money through inheritance. There is a living wealth transfer currently taking place that this country hasn't seen in decades." "These days, we absolutely design with a younger buyer in mind," says Lance Tate, a Los Gatos, Calif.-based developer who builds spec homes. "We try to limit walls as much as we can to create an open floor plan and we avoid any ornate nonsense. We try to build modern and we also put solar on a lot of our homes." Amenities are another draw, and many luxury buildings have had success luring millennials with the promise of pools, gyms, spas, and basketball courts. 515 East 72nd Street, a 41-story building in Manhattan, has all those features and 326 units that range from $725,000 to more than $12 million. In the last six weeks, managing director for Corcoran Sunshine Elaine Diratz, who oversees sales for the building, says she has sold about seven one-bedroom units to young buyers whose parents have assisted them with the purchase; only six one-bedrooms out of the building's 147 one-bedroom units remain. Kimberly Lucero, who runs sales for the Ritz-Carlton Residences at LA Live in downtown Los Angeles, says she was surprised by the number of young people interested in units at the building. "You think of the Ritz as a more traditional place for the older, affluent crowd." But today almost 15% of the building's residents are millennials, she says. "Our condos have been graduation presents for USC graduates more than once, or gifts to celebrate a kid's first job." To attract more young people, Ms. Lucero says she and her sales team upgraded the building's amenities in January, renovating the common areas where she noticed young residents like to entertain their friends. Now, in place of several generic lounges, the building features a sports-watching room with multiple televisions, a wine-tasting room, an entertainment library, a travel library and a daily breakfast buffet, served in a special lounge. "The fact that the building was all over Instagram, that definitely made me feel like it was new and chic," says Joseph Hanono, a 29-year-old who runs his own insurance company and is in contract to purchase a 600-square-foot unit in the building for close to $1 million. "I feel like my neighbors there are going to be the kind of people I want to be neighbors with," he adds, "people who make me feel confident that I am building real equity with this apartment, rather than owning some random stock."